After a resounding success last January, Les 7 Doigts de la Main (The 7 Fingers) are back in the UK this autumn with “Séquence 8”. 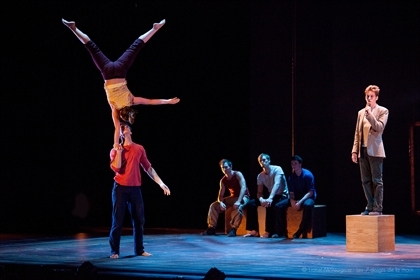 Created in 2012, coproduced by Les Nuits de Fourvière (Lyon, France) and the TOHU (Montréal), “Séquence 8” has received rave reviews from the beginning. The show has been presented over 300 times to 150 000 spectators in 15 countries. “Séquence 8” carries emotional dynamics to a point of explosion and propulsion.